There are many questions and concerns I hear about the Affordable Care Act Marketplace (ACA) and other health insurance options. This applies to all of us as we make decisions about what healthcare plans to purchase before the deadline. Major Medical Coverage or plans that contain Essential Health Benefits (EHB) such as prescriptions, mental health, and maternity are a mandate by the Federal Government and subject to IRS penalties if you do not participate. However, for many the ACA is anything but affordable because of the 20-40% arbitrary rate increases year after year making it simply unaffordable. Many people are electing alternatives to Major Medical Coverage. These plans are not too good to be true. They are simply a good and practical value as long as you’re well educated. These plans will not cover two of the largest areas of healthcare spending which are maternity and mental health. Also if you have a health event, such as a major heart attack, you will still have significant financial exposure. That said, in most cases a Hospital Indemnity (HI) Plan will more than meet most people’s needs. In fact, if properly utilized (i.e. going to the doctor for physicals, use of Rx, etc.) the plan should almost pay for itself and then of course you have the most significant ‘Insurance’ element of covering hospital stays and procedural surgeries where you are covered from $1,000 – $2,000 a day for up to 180 days depending if you are in a standard hospital bed or Intensive Care. These plans cover you up to $1,000,000. Let me clarify a point. Depending on the plan you choose and your age, the plan may indeed be ‘cheap’ to what I would say is economical compared to Major Medical. Let me give you an example. An Illinois resident chooses an HI plan that truly serves as a supplemental policy. It is only $50.00 per month but requires you to still carry Major Medical Coverage. This plan will indeed ensure you can meet your deductible and/or Out-of-Pocket Max in the event you are hospitalized. But what if you just need an out-patient surgery? This plan will not do much to alleviate the financial burden. 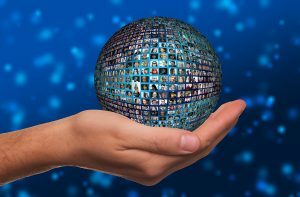 Conversely, you chose a more robust HI plan that has a full range of coverage and acts just like a Major Medical Policy in that you have a network and things like day-surgery are covered. This plan does not require you to have a Major Medical Policy. Now this plan is $175.00 per month; is that cheap? Not really. Is it a good value? ABSOLUTELY!! Minor surgeries are covered at $10,000. You have wellness visits and doctor’s visits covered at $100 per event, and you can even add a United Healthcare Provider Alliance card to really maximize savings. There are a few universal things I know about children: They are messy, talk back to you, drive you nuts, yet you love them unconditionally, and they get injured! A trip to the emergency room and overnight observation stay is $5,000 which is right about the national average deductible. A $25.00 Accident Plan is the best money you’ll ever spend to cover you and your children. Some folks have heard me talk about reimbursement and value ratios of these plans. This is one of the best at a 15:1 or 20:1 ratio. For every dollar you spend you could recoup $15-20 in benefits paid out. One of the things I am most passionate about is what they call Same Occupation Disability insurance. This is not to be confused with Short-Term or even Long-Term Insurance. These plans only last 3 to 6 months. In my experience and statistically speaking, disabilities last a year or longer. Also if you are physically able to work, it does not matter if it’s not in your field of expertise. Your plan will not cover you. Conversely, Same Occupation Plans will cover you to age 65 for multiple years if you are not able to perform your job functions in your chosen profession. While a bit more expensive than a standard STD/LTD plan, this is going to be the 2nd element of the best money you could ever invest in yourself. 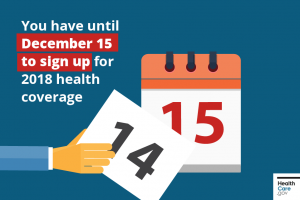 Reminder: Affordable Care Act Marketplace Deadline is December 15th. That’s 3 Days Away! Attention: This Friday, December 15 is the last chance to enroll. Check HealthCare.gov to select a plan before the final deadline or risk missing out on 2018 Affordable Care Act Marketplace coverage. Remember that all plans offer essential benefits such as emergency room visits and prescription drug coverage as well as preventive care including important shots and screenings. You may qualify for assistance to reduce your monthly premiums. Visit HealthCare.gov to complete your application and review your options before the final deadline.